Rainbow Falls in Watkins Glen State Park in Watkins Glen, NY. This photo location has been on my "to-do" list for at least 10 years. As a photographer, there are so many places on my "bucket list" to see in person and photograph. Watkins Glen State Park - and more specifically, Rainbow Falls, has been on my list for a long time. I saw photos of it online more than 10 years ago and on Saturday morning, I was finally able to capture it in the glory of early-morning light. The park is only 35 minutes from my new home in Ithaca, New York and the weather finally cleared up for a weekend hike. I wanted to accomplish two things - 1) beat the crowd of people and 2) take advantage of the morning light before the midday sun overwhelmed the gorges. So, I got up at 4:30am, loaded my gear and headed west. Part of the experience, to me, is taking in the surroundings not just of the destination, but of the journey there and back. So there's a sunrise shot along Hwy. 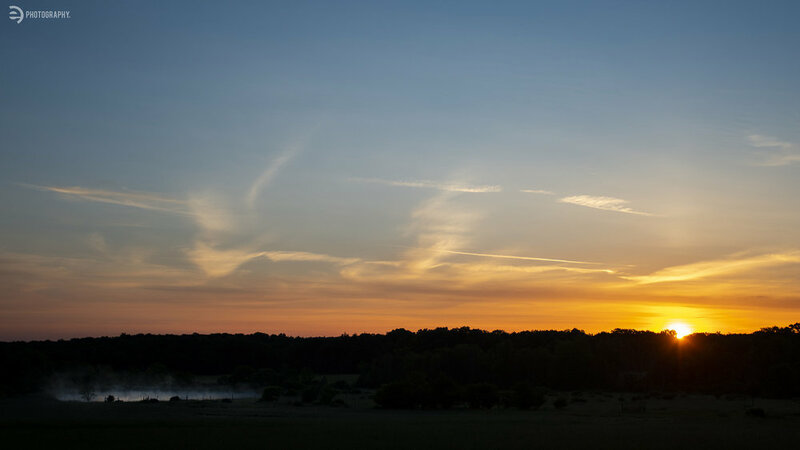 79 of some farmland with a steaming pond in front of a beautiful sunrise and the last couple photos are of Taughannock Falls in Trumansburg, NY, a pit-stop on my way home. When I arrived just after sunrise, there was only one other car in the parking lot, so I knew I was in for a peaceful photo-taking experience. I'll let the photos speak for themselves below, but as I hiked back through Watkins Glen State Park - I was captivated by the beauty of the park. The rock formations, the waterfalls, the vegetation, the sustainable paths created for enthusiasts like me - everything was just absolutely gorge-ous (sorry, had to). I had an incredible experience and I hope you all enjoy the photos. Cheers! My wife will attest that I LOVE pulling over on highways and byways to take photos of the everyday things we normally just see through the car window. This pond and the steam rising set the scene for what turned out to be a beautiful day of hiking and photos. Looking back toward the main entrance to Watkins Glen State Park from Sentry Bridge at first light. I spent a lot of my time spinning in circles, literally, so I didn't miss any of the incredible views from the Gorge Trail in Watkins Glen State Park. 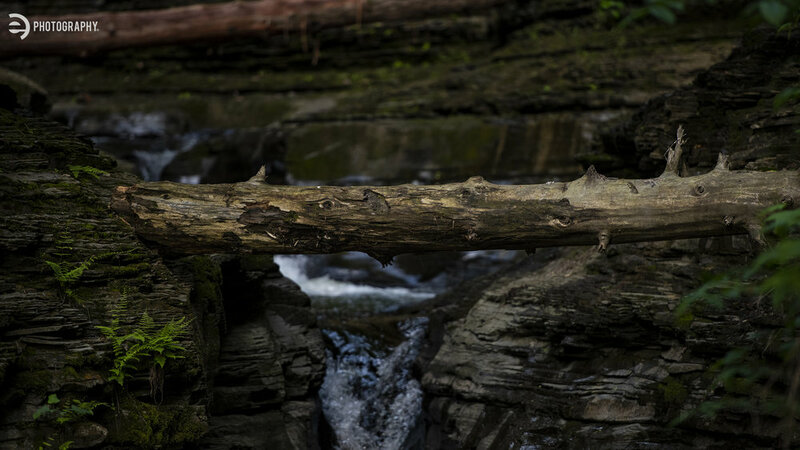 I love that the trail system at Watkins Glen State Park was integrated into the the natural landscape and it forces you to walk through tunnels and behind waterfalls. Sometimes I get caught up in my mission and forget the details, but this little fern caught my attention as it peeked out from behind a wall of stone. A wide-angle view of the trail (right) and a set of smaller waterfalls (left) in Watkins Glen State Park. There were several fallen trees in the park, but this weathered log stole my attention for a couple minutes during my early-morning hike. 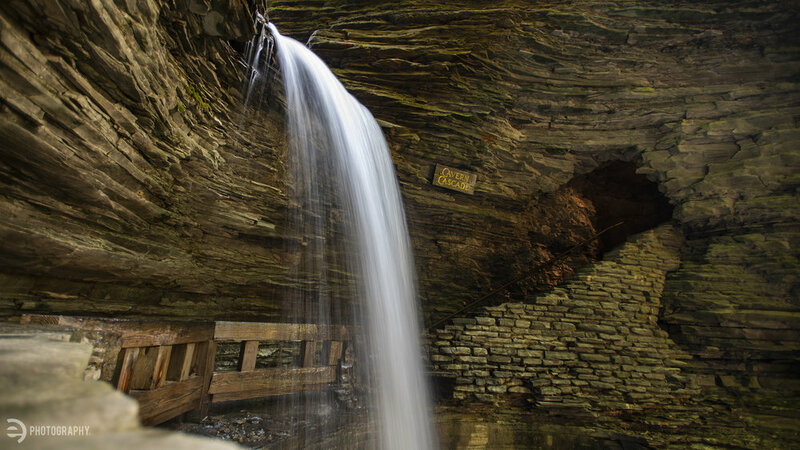 Cavern Cascade is the first large-scale waterfall you encounter from the main entrance of Watkins Glen State Park and it quickly becomes an immersive experience, as the trail leads you behind the falls and farther into the park. 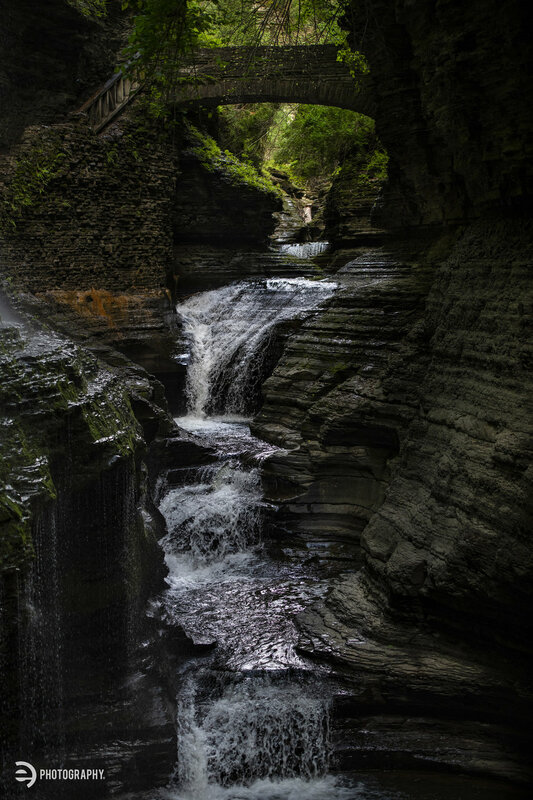 Every little nook and cranny offers a glimpse of something spectacular at Watkins Glen State Park. A vertical shot of Rainbow Falls to match the horizontal opener at the top of the blog. It was an awesome experience to finally see in person! This is the top side of Rainbow Falls, looking back down to where I was standing for the previous photo. Right before getting to Rainbow Falls, you get another trail shower with this thin waterfall. The views are everywhere and from about every angle. 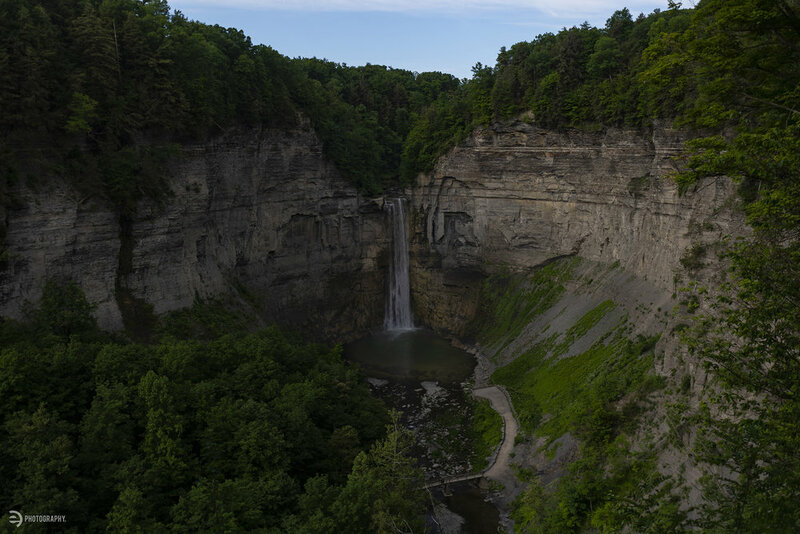 This is Taughannock Falls in Trumansburg. I figured if it was on my way home from Watkins Glen, I might as well stop and take in the beauty! At 215 feet, this is the tallest waterfall in the northeast. I will definitely be coming back in the autumn to see all the fall colors on these trees! Thanks for stopping by the blog!